The Drop is an atmospheric crime drama worth watching for Tom Hardy's performance alone. The story doesn't seem to really know what it wants to be, but he plays his character perfectly. He manages to look good next to James Gandolfini doing what James Gandolfini does best. He's very quiet and keeps to himself, but you can tell there's something volatile beneath the surface, some remnants of a troubled past. This is hinted at gradually though his mannerisms (as well as through some of the lighting), so that when the movie reaches its climax, it earns its sudden power. It's real strength, however, lies in its gorgeous cinematography. And I mean really gorgeous, not just "it looked pretty good but nobody will listen unless I oversell it a little." This movie is beautiful. Like Se7en, the blacks are really black, none of this dark-gray, almost-black nonsense. The shadows could pull you in if you lean too close. Then, on top of this neo-noir aesthetic, it still manages to make full use of the range of its color palette. Outside, the city is cold and mostly colored with desaturated browns and blues (think Tinker Tailor Soldier Spy); but inside the bar, everything is richer and more vibrant, with vivid reds and yellows (think Nicolas Winding Refn). I'll stop there because I can tell that if you haven't skipped down to the next paragraph already you're about to, but when I say this is the one of the best looking movies of the year I don't want to sound like I'm just being rhetorical. It really is a visual delicacy. 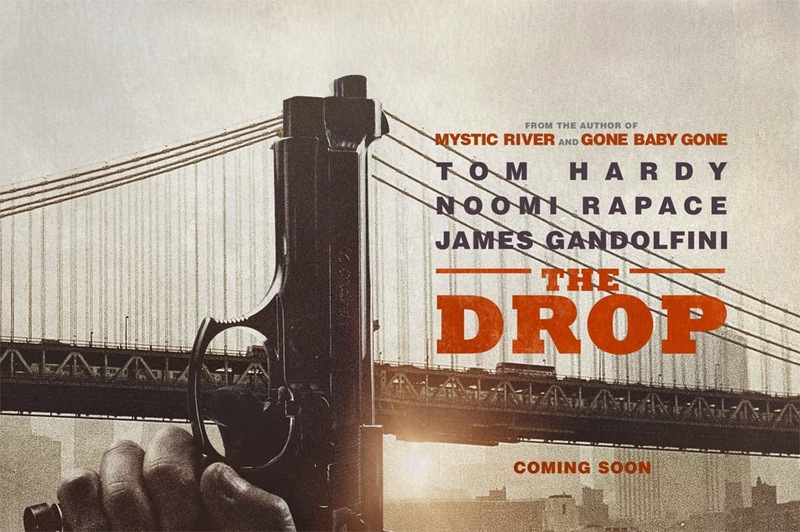 Unfortunately, beyond Tom Hardy and the film's visual aesthetic, there's not really much on which to recommend The Drop. It opens on a lovely shot of a reflection of the city in a puddle over which plays the dullest, straight-out-of-the-trailer voiceover narration, and this moment is a microcosm of what's to come in the rest of the film. Pretty, but pretty bland. It's a fairly standard Dennis Lehane story (sorry, moving from Boston to New York doesn't really change much), so if you've seen Gone Baby Gone or Mystic River then you know exactly what to expect. Compared to his other work, though, this is disappointingly scattered. There's a lot going on, and yet it always moves slowly and doesn't manage to add up to much. It feels like a collection of loose ends which never quite tie themselves together to form a single thread. Call it slow-burn if you want, but the fire went out for me on several occasions. It does pick up toward the end, but the first two-thirds are a bit too meandering with an overabundance of thinly drawn subplots. Interestingly, this is the first time Lehane's material is not being brought to the screen by a big name (previously: Clint Eastwood, Ben Affleck, Martin Scorsese). In 2012, the Belgian director Michaël R. Roskam's film Bullhead was nominated for the Foreign Language Oscar, and now he's in America and has made The Drop, a decidedly American film, so if nothing else he's showing great versatility. The screenplay he's working from just needs some improvement. Lehane wrote the screenplay himself, and here we have another case of a novelist whose work has previously been adapted for the screen now trying to adapt the material himself without enough experience in the different world of screenwriting (see also: The Counselor). Roskam gets solid performances out of his cast, but with the exception of Hardy's character there's just not much of any interest here (Noomi Rapace's "damaged goods" stereotype is particularly unfortunate). I hope I haven't been too hard on The Drop because it really does have some great strengths, and in spite of my problems with it I think it's still basically worth your time. If I've been overly critical it's just because the film's strengths make its weaknesses all the more disappointing. It's not a bad movie, it just could have been a much better one. "There are some sins that you commit that you can't come back from, you know, no matter how hard you try. You just can't. It's like the devil is waiting for your body to quit. Because he knows, he knows that he already owns your soul. And then I think maybe there's no devil. You die... and God, he says, 'Nah, nah you can't come in. You have to leave now. You have to leave and go away and you have to be alone. You have to be alone forever.'"